Tomorrow’s game against Watford will be the 114th time we have come up against the Hornets. Albion have a slightly better head-to-head record, with 44 wins to Watford’s 36, while 33 have been drawn. For this week’s column we go back nearly 30 years, to a season where the two sides were fighting it out at opposite ends of the Division Two table. Albion had come up from the third tier the previous season and made a disastrous start to life back in Division Two, losing their first six games. By Christmas, we were languishing in 22nd place but two wins over the festive period, including a 3-1 Boxing Day win against Crystal Palace, brought temporary respite. An early exit from the FA Cup meant we really could concentrate on the league and by the time Watford visited at the end of February 1989, we had pulled ourselves seven points clear of the drop zone. The team he entrusted with getting us out of trouble more or less picked itself due to injuries. Steve Gatting and Larry May were missing, as were Robert Codner and Steve Penney. John Keeley was in goal, behind a back four of Gary Chivers, Ian Chapman, Nicky Bissett and Keith Dublin, who was moved into a more central position. In midfield, Dean Wilkins was alongside Mike Trusson, Adrian Owers and Paul Wood. Up front, Kevin Bremner and Garry Nelson had scored 19 of our 40 goals so far in the season. It was a very wet February day and the groundstaff had been at the ground since early morning, trying to remove the surface water. Lloyd had hoped for a crowd of over 10,000 but the driving rain kept many people away. 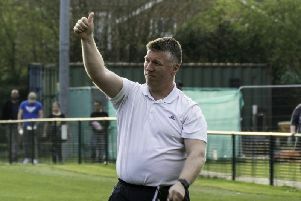 Despite the challenges brought by the conditions, Albion put in a performance described by Lloyd as “disciplined and professional”. The game was settled by Bremner’s 13th goal of the season, a towering header. Wilkins was classy in midfield, seeming to glide over the sticky surface. All our hard work may have been in vain, if it wasn’t for a magnificent save at the far post from Keeley just minutes from the end. The win took us to 20th in the table, nine points clear of relegation. The remainder of the season saw a continuation of our topsy-turvy form, including four defeats and two draws in our last six games. We were helped by the poor form of Shrewsbury Town and in particular Birmingham City and Walsall, who ended up well adrift. Watford visit the Amex on Saturday with Albion looking to bounce back from the second half horror show at Craven Cottage. A repeat of the battling performance in 1989 will go some way towards getting us three points closer to safety.